Racing got its annual taste of Hollywood glitz and glamour as the Darley Awards and the HH Sheikha Fatima Bint Mubarak Awards took place at the Dolby Theatre – the home of the Oscars – in Los Angeles on Friday night. 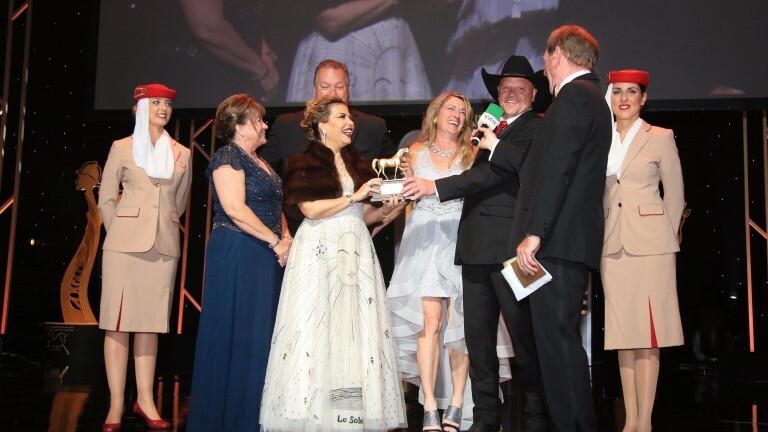 The lavish ceremony celebrated the achievements of Purebred Arabian racehorses and the impact of women in the sport, crowning 25 category winners, in addition to select key contributors who received special awards. There was British success on the evening courtesy of Debbie Burt, who was crowned best photographer for the first time. "It's an incredible honour to win this award – this is now my fourth nomination in this category, said Burt. "The Sheikh Mansoor Festival, and Sheikha Fatima Bint Mubarak series of races, has helped to promote Arabian racing in our country and around the world." The prestigious Horse Of The Year title was won for the second year in succession by Paddys Day. The six-year-old also scooped the award for older horse of the year, while his handler Scott Powell bagged the trainer of the year prize.